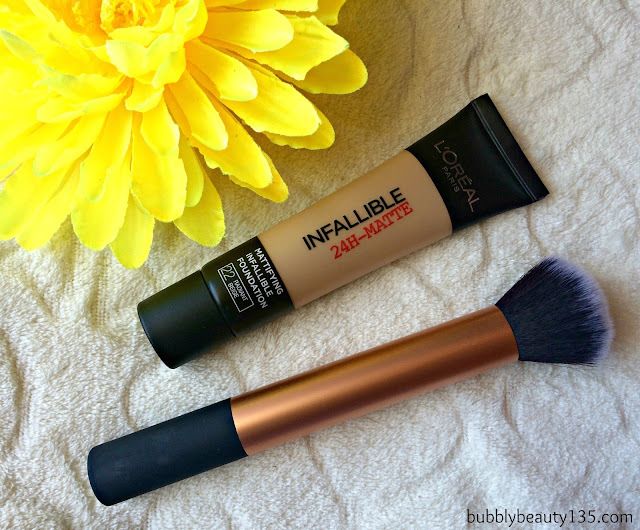 Today i have for you a review (surprise surprise) about my favorite foundation lately.It's kind of a new product but i'm sure that you already saw it a lot around blogs and videos.I will talk about the Infallible 24h matte foundation by L'oreal. 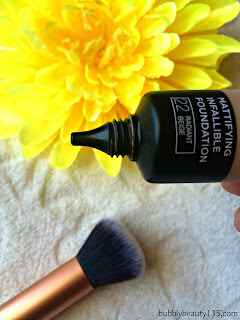 This is the new version of an other foundation by the same brand and it was the infallible 24h,the one in the glass ''package''.I was,and still i'm in love with that foundation.So when the new,matte version came out i needed to get my hands on it.I'm in the shade 22 Radiant Beige and i completely recommend you this foundation if you have oily or combination skin.If your skin it's dry i will suggest you to stick with the first version of this foundation. What i love most about it,is that it's matte and has a powdery finish,sometimes i even forget to apply powder on the top and works just fine for a couple of hours.It makes your skin look matte,but not the dead/without any glow matte. Although that has a pretty good coverage,it's not heavy in your skin,it's surprisingly too light,like second skin or something. Something else that deserve to mention about this foundation it's the packaging.The kind of plastic tube it's perfect for travelling and has a small tip,so you can perfectly control the amount that you need and can't waste any amount of the product. The only ''bad'' about this product,it's that doesn't have SPF.But for me this is not bad at all,because this mean that you will not have any problem with the flash when you want to take a photo and second you can apply a cream with SPF underneath. Also i will be more that happy if you let me know what posts do you want to see next in my blog ! ! great post honey! Is it also suitable for oily skin? Thank you <3 It's perfect for oily skin ! Love Real Techniques brushes! As silly as this sounds they have made foundations I hate look good! Such an amazing foundation, I love using it on my T zone! My face stays matte for such a long time! I cannot wait to try this foundation!! I have heard so many people raving about it I want to see what all the fuss is about. I also love this real techniques buffer brush, It makes applying foundation so easy and I enjoy putting on my foundation with it. Will definitely be buying this product, thanks for the review!